Pearl Wool and foam board protected in plywood crate. Or simplified wooden pallets. The powder coating of PVDF material is generally with a coat thickness of about 35-60 microns variable with the hiding rate. If coating with a much brighter color, the thickness of the coating film should be thicker, vice versa. The material of PVDF is generally used for the outdoor decoration. However, for some special areas such as much more humid places, the PVDF coated aluminium honeycomb panel will be also applied. 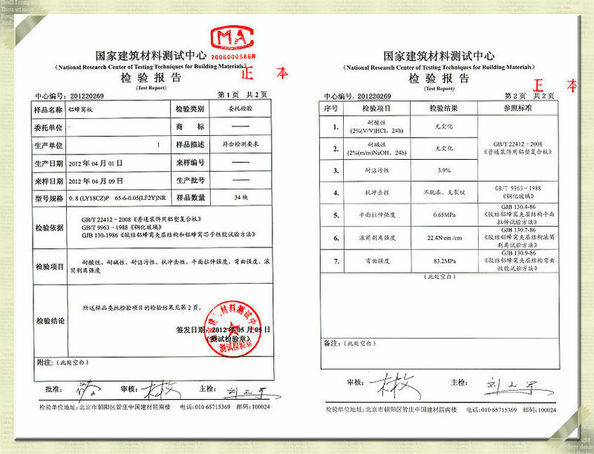 Polyvinylidene fluoride, or polyvinylidene difluoride (PVDF) is a highly non-reactive and pure thermoplastic fluoropolymer produced by the polymerization of vinylidene difluoride. PVDF is a specialty plastic material in the fluoropolymer family; it is used generally in applications requiring the highest purity, strength, and resistance to solvents, acids, bases and heat and low smoke generation during a fire event. Compared to other fluoropolymers, it has an easier melt process because of its relatively low melting point of around 177 °C. 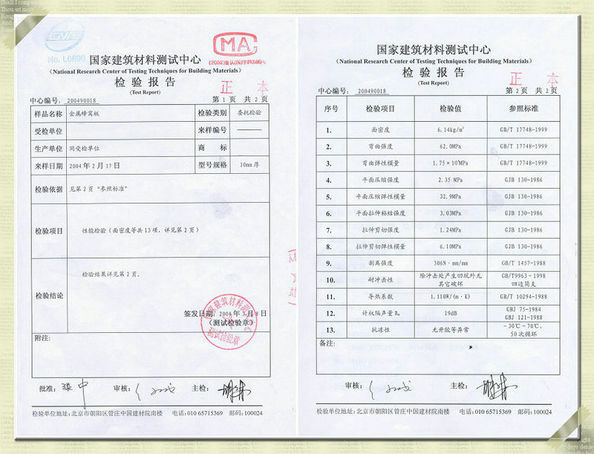 It has a low density (1.78 g/cm3) compared to the other fluoropolymers. It is available as piping products, sheet, tubing, films, plate and an insulator for premium wire. It can be injected, molded or welded and is commonly used in the chemical, semiconductor, medical and defense industries, as well as in lithium ion batteries. It is also available as a crosslinked closed cell foam, used increasingly in aviation and aerospace applications. A fine powder grade, KYNAR 500 PVDF or HYLAR 5000 PVDF, is also used as the principal ingredient of high-end paints for metals. These PVDF paints have extremely good gloss and color retention, and they are in use on many prominent buildings around the world, e.g. the Petronas Towers in Malaysia and Taipei 101 in Taiwan, as well as on commercial and residential metal roofing. PVDF membranes are used for western blots for immobilization of proteins, due to its non-specific affinity for amino acids. 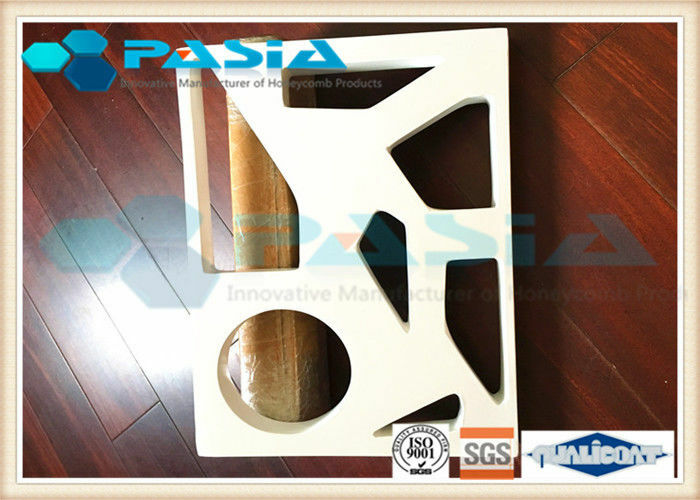 The Roller coating can save the production cost campared to the powder coating but the quality can be very uniform. Aluminum honeycomb panel is a bonded sandwich structure system of two surface aluminium plates and one honeycomb cores with a special purpose adhesive. Industrial used aluminium honeycomb panel will add some more processes such as surface treatment, edging, embedding, carving and so on to make the panel suitable for special conditions. It has been widely used by the industries of civil construction, transportation, exhibition, signage, elevator, clean room etc. The honeycomb technology is from aerospace technology. The whole production process is finished in the modern factory, using hot pressing or vacuum pressing technology. Due to the high thermal conductivity between the aluminum plates and honeycomb, it is synchronized the thermal expansion and contraction of the inside and outside aluminium material. There are small holes on the honeycomb core foil wall so that the air is free of flowing inside the panel box. Furthermore, sliding mounting buckle system does not cause structural deformation during thermal expansion and contraction. The center material is aluminum hexagonal honeycomb with a small density (about 3 to 7 kg per square meter), about 1/5 of the weight of wood with the same area and thickness, 1/6 of the glass, 1/7 of solid aluminium, which greatly reduced the building load and construction cost. Thanks to the air contained in the core, the panel can be sound and thermal insulated. Because of no combustible material contained, the fire rating can be at least B1 level. The panel performs well also on waterproof, moisture-proof, no harmful gas release, with a high unit mass of the specific strength and stiffness, not easy to deformation, completely overcoming the collapse and deformation in the center area if with large panel. The panel edge can be cut depending on real conditions. The PVDF coating can guarantee the product life more than 30 years. 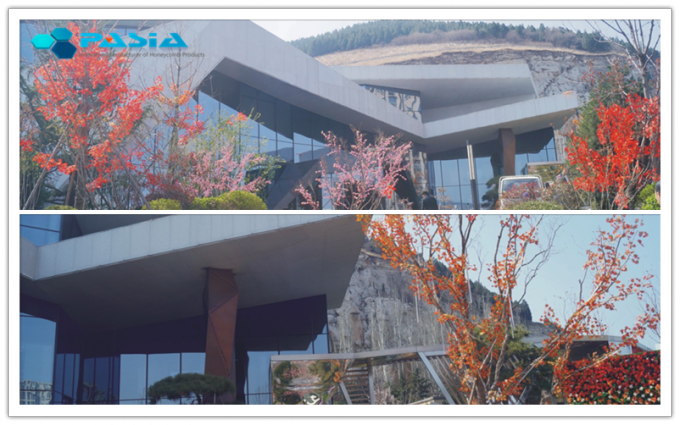 After surface treated with corrosion resistant fluorocarbon resin, it can be widely used on curtain wall, roof, large façade, signs and interior decoration. The front plate of the aluminum honeycomb panel is painted with E. C. C. A. quality standards PVDF fluorocarbon paint with ordinary color or metallic color, so the surface has excellent weather resistance. In case of heavy rain, there is particularly large noise when the raindrops hit the aluminum veneer or aluminum-plastic panel, while honeycomb panel can avoid this situation. Aluminum honeycomb panels are generally made of fluorocarbon coated aluminum plates. The continuous roller coating with PVDF material is the most important point to avoid color difference and flat coating film. Based on this, it can keep the exterior building with bright color for long time. 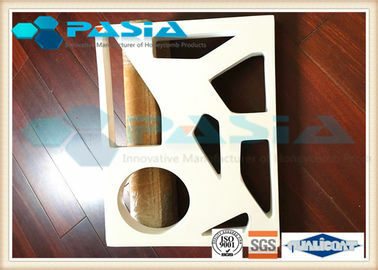 Quality Guarantee Period: 10 years or 15 years.